This is to certify that I have prescribing Transval Self-Care products to my patients for the last 2 years. The feedback has been very positive, especially for Back Buddy, Versatile Seat, and Lumbar Roll. I regularly use 'Back Buddy' for the past couple of years. I find it very comfortable. At my age of 73, I never had back ache or pain. Based on the feedback, a flight trial of two types of lumbar cushions one locally fabricated, another commercially available called ' back buddy' was carried out. 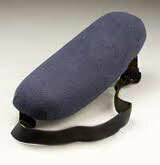 12 Pilots were involved in the flight trials, There was an overwhelming acceptance of ' back buddy ' during the trials. It has been a matter of experience to me that the Back Buddy is a product which is extremely helpful in postural correction. It provides spinal support to maintain lumbar lordosis, thus avoiding strain on the back and also help people who has to drive for long distances in city. This is to certify that I have been using Back Buddy & Cervical Pillow for last 8 years with extremely good results for POSTURAL SPINAL PAINS. Its not possible to keep posture straight at all times by oneself, which BACK BUDDY can do with ease at a very nominal cost. This is to certify that I have been using back buddy for posture related back disorders and lumbar spine instability along with postural exercises and I have found it very useful. This is to state for your information that the products of Transval - Mainly Back Buddy, Contour Pillow and V-Seat are prescribed by me and they are very useful to my respective patients. This is to certify that Back Buddy, an Orthopaedic posture correcting back support, is effective in controlling and preventing back pain due to lumbar spondilytis, facet joint wear, spinal imbalance and postural back ache. Patients with acute disc prolapse also experience great relief using this, in office chairs and car seats.
" Transval Back Buddy "
Perfect backrest for you at office, home or while driving. Have a world class orthopaedic specialist to back you up while at work.
" Recommended and Endorsed by Orthopaedic Doctors / Therapists / Physicians. Complete back support during pregnancy. Back Buddy std. with its in-built horizontal and vertical spring wire frame helps in adjusting the posture to accommodate the new weight by supporting the curving spine, Takes care of spine stress, lower, upper back and shoulder pain.
" Back Buddy (Senior) "
Reduces back and neck pain associated with swayback due to bad posture. Useful appliance for all Offices, Automobiles, Industries, Cars, Homes and Hospitals. 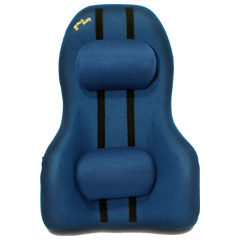 The High back design provides cervical support apart from lower and upper back.
" For back pain control through posture correction "
" Back Buddy (Junior) "
Increases load transfer to the backrest and a reduced disc pressure. Anatomically designed, fits snugishly to the natural contours of your lower back. Easily portable and can be fitted to any chair, at workstation, in car, at home Foam construction, with built-in sprin steel wire frame provides postural correction. During pregnancy, the body's center of weight changes dramatically, which in turn affects the lower back severely. Back Buddy Jr. with its in-built horizontal spring wire frame removes considerable level of stress from lower spine. Take the "ache" out of backache - Designed to prevent and relieve back stress.
" Transval Back Support "
This back support Helps to alleviate lower back and improves. posture and provides correct spinal alignment resulting in stress relief for back muscles and discs. Manufactured on the basis of international orthopaedic research to provide the natural contours of the back, totally adjustable for individual comfort totally adjustable for individual comfort. Portable and lightweight, can be used on any chair or seat anywhere. A simple appliance to support lower back during pregnancy. Manufactured from, polyurethane foam with Ergonomic design. "Transval Lumbar Rolls and Pads"
Transval Lumbar Roll, fills gap between chair back / car seat and your lumbar. Most available chairs or vehicle seats hardly provide any lumbar support. Ergonomic design helps seating / Browsing / Driving in relaxed posture and reduces low back pain. The Transval Lumbar Roll is useful during acute and chronic cases of back pain caused by wrong postures, long hours of sitting and back injury. Relieves lower back pain while you sleep. properly supports the spine while sleeping on the side or back. Helps in obtaining the ultimate night's sleep without morning backache and stiffness. Provides continuous comfort not available with a mattress. Makes mattress sleeping surfaces much more comfortable. Manufactured from moulded foam. (No shape distortion like fiber filled) Guaranteed shape for longer period. This comes in two sizes---- (2.5" * 22") stomach-up to 46" and (2.5" * 27.5") stomach-above 46".
" Improves posture and maintains correct ergonomic seating in office." Most comfortable for those with tender tail bones coccyx, hernia, or pile patients.
" Helps lordotic curve in the lumbar spine. " 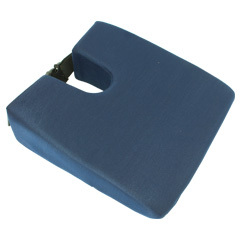 This orthopaedic wedge pillow with 12° angle corrects seating posture at work or while driving. During pregnancy, apart from helping in preventing back and hip strain. It will also help your baby to go into the pelvis after 36 weeks of pregnancy, especially if your knees are slightly lower than your hips. 1. Free home delivery on above Rs.1000 order for all major cities in India. Add extra Rs.80 for below Rs.1000. Inclusive of tax and courier.